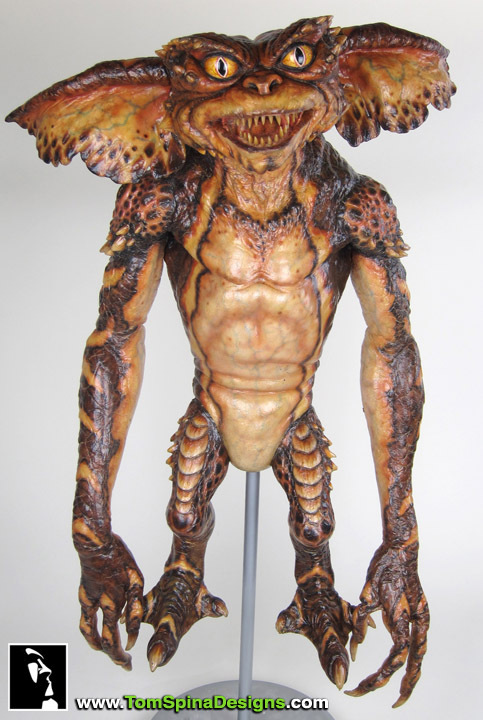 Another incredible Gremlins puppet from Gremlins 2, the New Batch created by Rick Baker’s Cinovation Studios. This awesome screen used prop Gremlins puppet was in fair condition when he arrived in our studio, but exhibited damage on its foam latex neck. The brown Gremlin puppet needed of a bit of conservation/repair and also proper support. 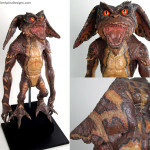 The necks on original Gremlins puppet props often have damage from years of hanging in storage after the movie wrapped. The weight of the body put stress on the thin foam latex of the neck and resulted in tearing of the skin. 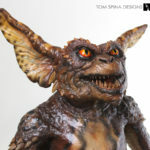 With aging foam latex movie props like Gremlins puppets, support can make a big impact on both how the prop displays and holds up over time.Click here to see how some of our other Gremlins movie prop restorations turned out. The front of this brown Gremlin prop had some fairly obvious damage to the foam latex skin. 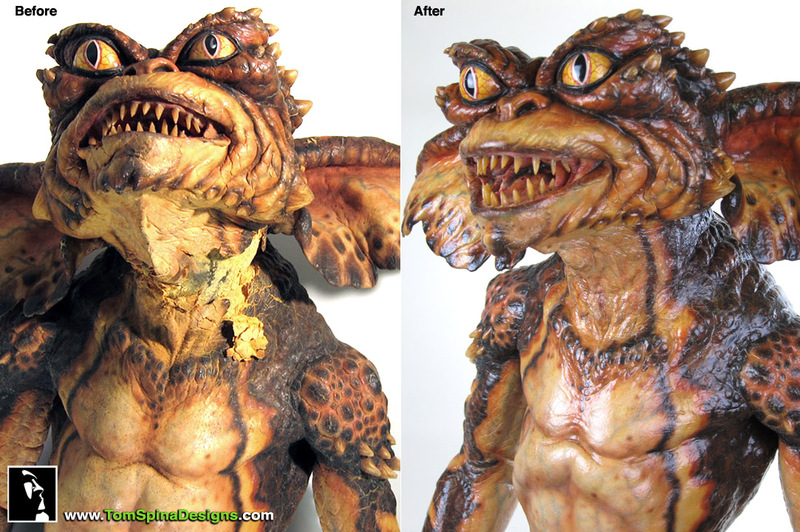 We patched the puppet’s neck, using archival materials to rebuild the missing skin and match the textures of the original sculpture. We then set about creating an internal support to take the stress off the neck. This step is possibly the most important part of the conservation work we do. 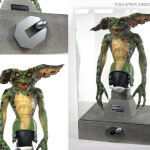 The customized, archival support stand means the movie prop puppet’s fragile neck now doesn’t bear the weight of the whole foam body. 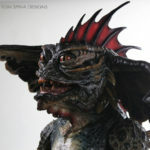 This will help minimize further damage to the foam latex neck and keep the prop in a nice position for display as well. 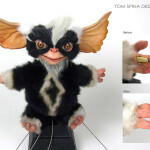 With every movie prop restoration project we discuss in great detail our clients’ desires for their piece of movie history. This client requested that we give him a “slimy” gloss finish when sealing the movie prop. 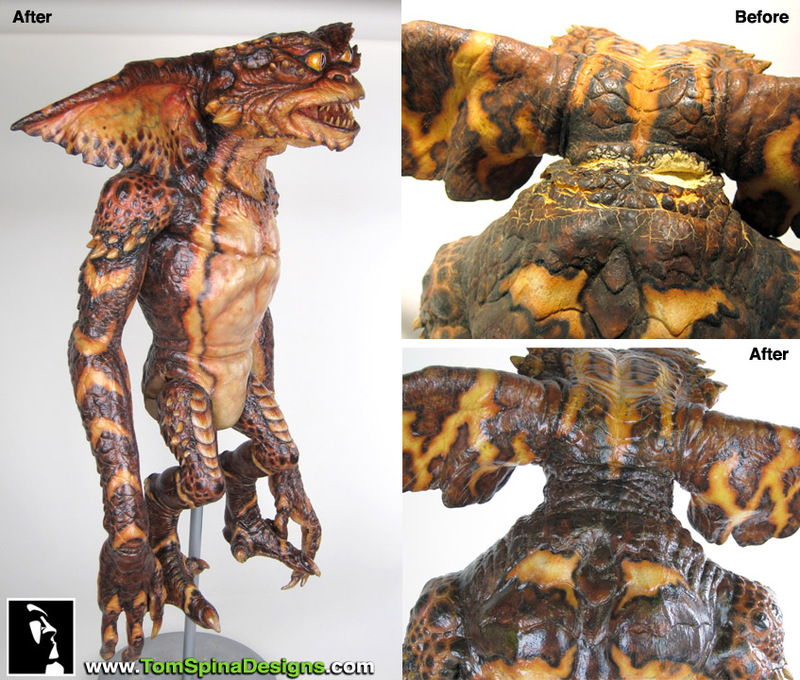 We often incorporate sealers into our work, to help slow the hands of time on this foam latex puppet. 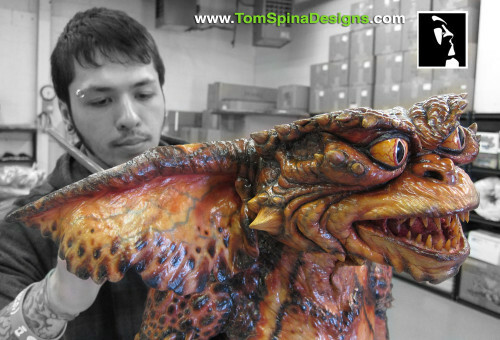 We can dial in the level of shine anywhere from high-gloss to a dead flat finish when applying a sealer to original movie props.